Allows you to utilise the insulation you're carrying lower down, climb through greater temperature ranges & be more comfortable & adaptable. The materials used are on the cutting edge of design for high altitude gear and the build quality is exceptional. 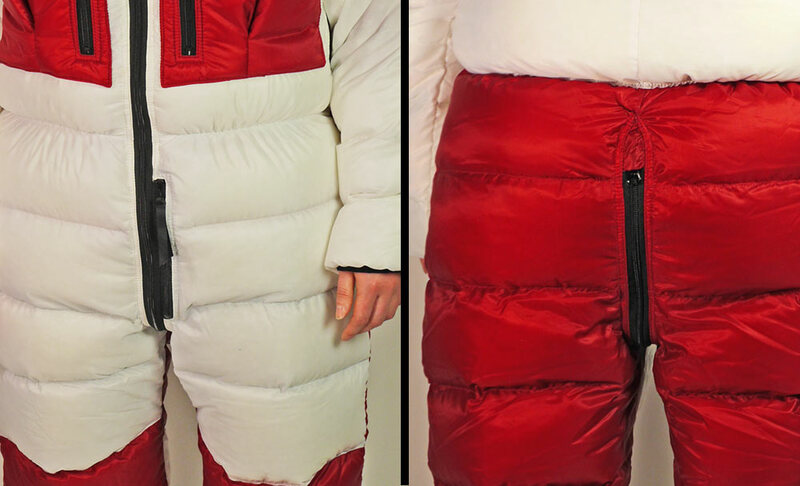 An expedition double suit made of 2 layers: a one-piece Inner Down Suit & a two-piece Outer (down Jacket & Trousers). Designed to cope with the extreme temp. range in high altitude mountaineering. When choosing size, select Body Width first. 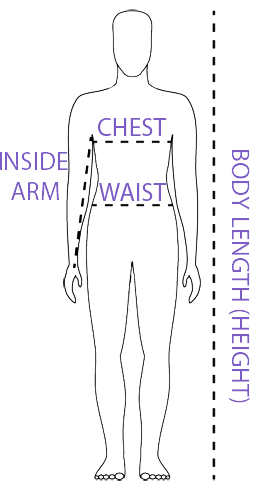 Body Length can be 1 or 2 sizes smaller or larger than your selected Body Width. Inside Leg can be 1 or 2 sizes smaller or larger than your selected Body Width. Arm Length can be 1 or 2 sizes smaller or larger than your selected Body Width. 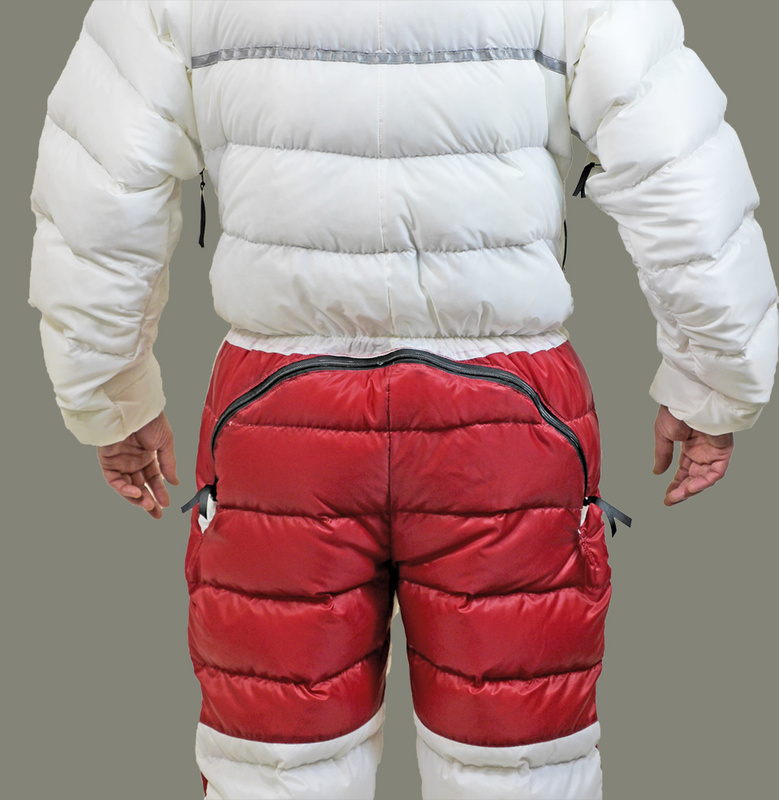 A warmer version of the Expedition Double Suit is also available with a typical operating temperature of -50°C (-58°F). 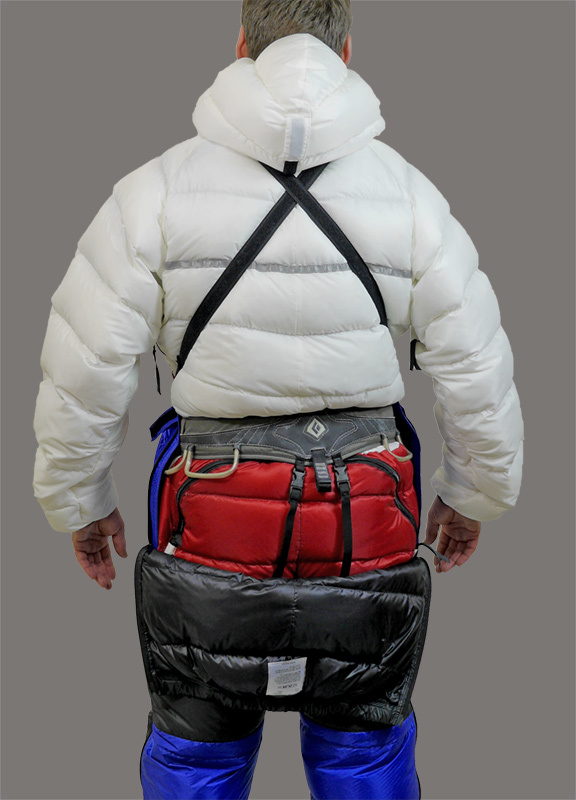 We recommend the warmer version for no-oxygen ascents on 8000m peaks. New: Now available in custom sizes: specify body width, body length, arm length and leg length independently. 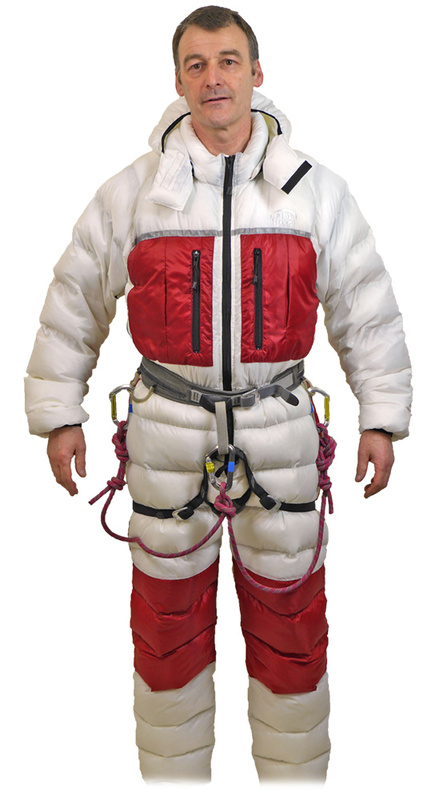 Designed to function in extreme cold and at very low oxygen levels, down-filled suits have become standard for high-altitude mountaineering. However, over the course of a long day, mountaineers can face enormous temperature changes from factors—such as wind speed and cloud cover—completely beyond their control. Heat-exhaustion and fatigue from dehydration often cause more of a problem than the cold, and a climber’s harness can make things worse, preventing the removal of a single suit. The PHD Expedition Double Suit solves these very real issues. It is more versatile and much lighter system than single suits, with more comfort and ease of movement. 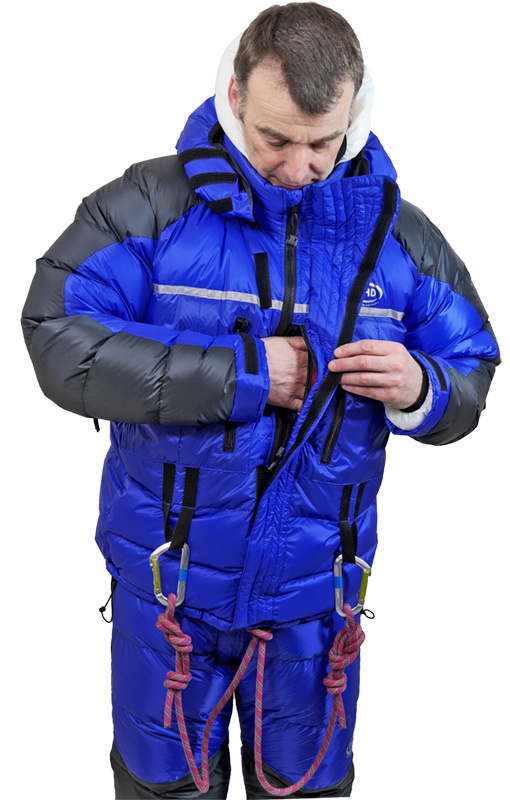 The Inner suit can be ‘lived in’ from the lower camps to the summit, while the 2-piece Outer suit is easy to put on for the summit push or whenever conditions require it. Innovative features like heat-pad pockets at the wrists, a harness tie-in slot, lanyard clip loops and the flared storm baffle all add greater functionality and performance to the system. The first of its kind in the world, the PHD Expedition Double Suit is a whole new approach to down clothing for high-altitude mountaineering. This suit is now also available in custom sizes. Specify Body Width, Body Length, Arm Length and Leg Length independently to order a made-to-measure suit. This tailor-made service can cope with sizes from XXXS to XXXL and is ideal if standard, ready-to-wear patterns are not a good fit for you. Please note: If you order a custom-sized version of this suit it will take longer (approximately 45 days) to be manufactured ready for dispatch. Custom-sized versions of this suit are not returnable and customer loyalty discount cannot be applied. Our founder, Peter Hutchinson, made the first ever one-piece Down Suit (for Don Whillans on Everest) in 1971. Since then the design has been recognised as the best kit for the highest peaks and copied world-wide. Improvements have been made, but there has been no radical change until the new PHD Double Suit in 2017. Could we cut down the weight and bulk of our extreme sleeping bags? Down suits gave excellent protection, but they were often too hot on the way up to the high camps: could we make them more wearable across a wide range of conditions? We kept making our suits and sleeping bags lighter and lighter without fully answering either problem, until we decided it was time to think things out from scratch. Only at that stage did we start to realise that these questions were linked. Sleeping bags for the high Himalayas have to cope with extreme cold. That’s a definite. But keeping down clothing on at night inside the bag means a much lighter bag can deliver all the warmth needed. It had often been done on an ad hoc basis, so we simply designed the best combinations to work in the most effective way and made it possible to plan expedition night gear in a new way. After tests at altitude, that came out as our award-winning Sleep Systems in 2016. First question answered. How could we make a suit warm enough for the summit that didn’t fry the user on the lower slopes? A traditional Down Suit has great advantages in protection and simplicity, but once you’ve put it on, you’re in there for the day, maybe the week. The range of temperatures you pass through on a big mountain are enormous. 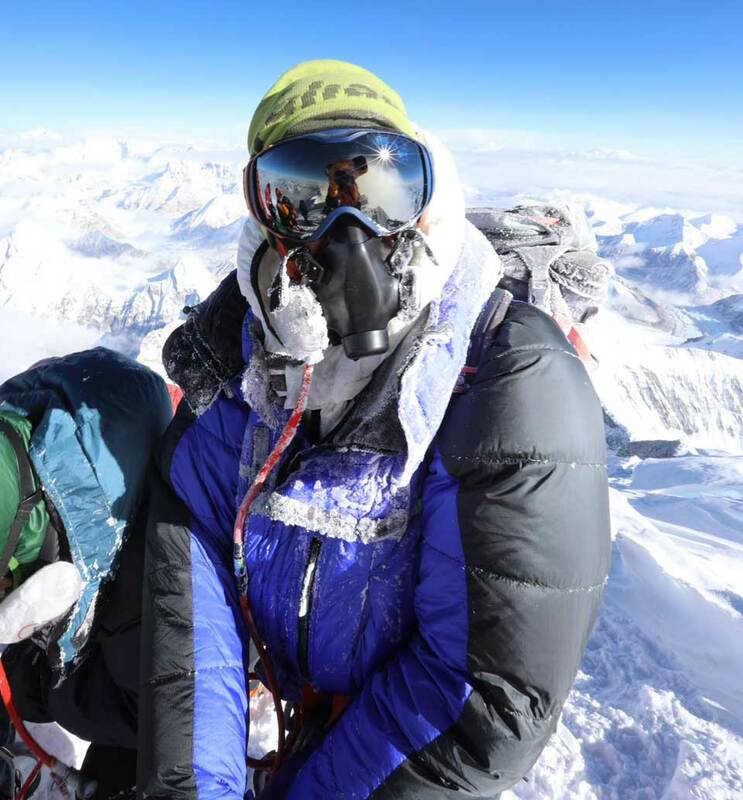 No question you’ll need the suit on your summit push, but on the way up in places like the Western Cwm on Everest you may overheat beyond the point where any ventilation system can cope. Then we hit on the idea of splitting the traditional single down suit into two. One on top of the other, both extremely light. The one-piece inner suit for the climb up to 7000 metres where overheating seemed to be a common problem. The two-piece outer a quick overfit to bring the combined double suit up to full summit performance at 8000+ metres. We had to solve a number of design difficulties and our first tests of the double suits on both sides of Everest were stopped short by the avalanches of 2015. Since then success on two separate 8000m peaks in 2016 confirmed that this really is the way to go. Surprisingly the double suit is lighter and simpler to use than a single and offers a whole new versatility of temperature control, both day and night. Under & Up zip: The central front zip on the suit runs from the collar, down the front of the body, past the groin and then under and up to waist level at the back. A two-way zip allows access at any place. Rainbow Seat zip: A rainbow / semicircle zip is sewn in across the backside. 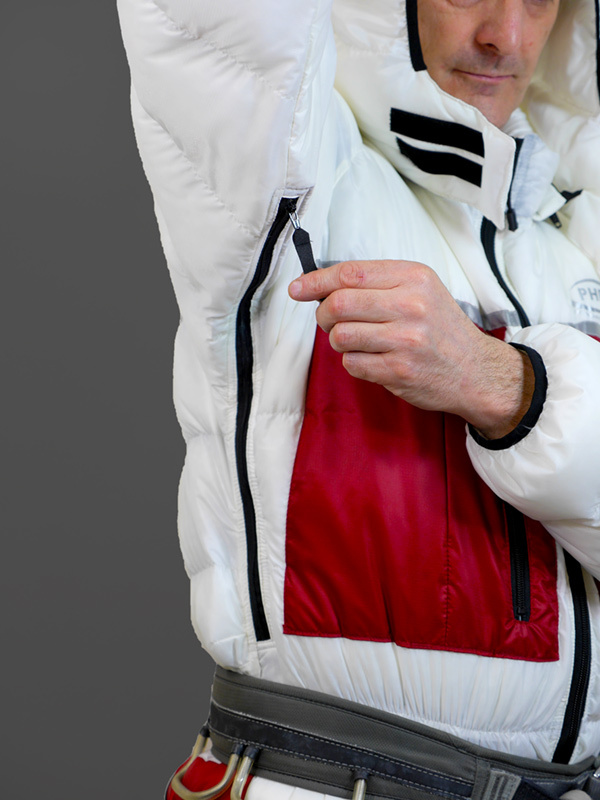 A two-way zip allows access and creates a drop down flap. The lightest of PHD's coated materials. 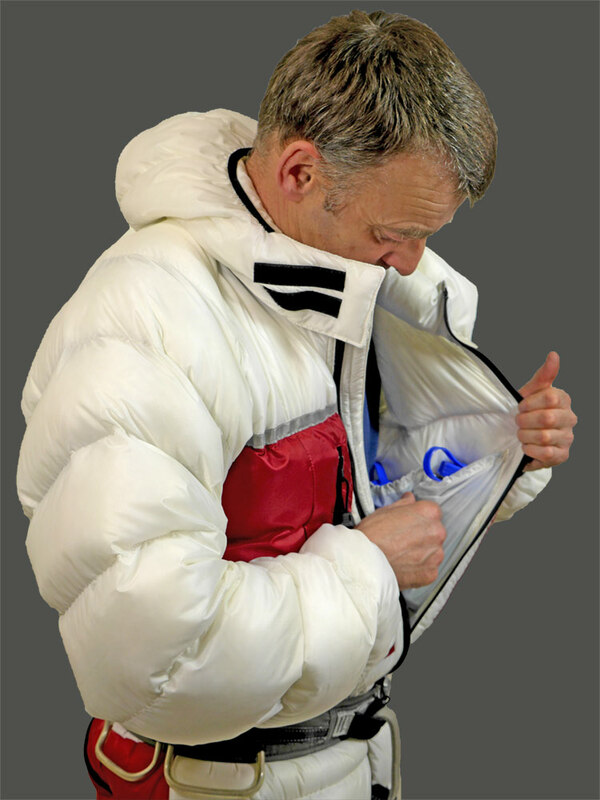 This ripstop nylon provides complete wind block and good water resistance at minimal weight. Ultrashell gives an excellent upgrade to performance with very little weight penalty. Lightweight silky microfibre. This close-weave 20 denier fabric is fully downproof, but also light and flexible enough to allow the down full loft. A reliable performer that has been the basis for much of our lightweight gear for some time. The PHD Sizing Chart below is based on measurements without clothing, exactly the way you would buy a shirt, a sweater or a pair of trousers. A 42" (107cm) chest means that your bare chest uninflated measures 42". Inside Arm is measured from armpit to wrist-bone. Inside leg is measured from crotch to ankle-bone. Once you've selected a Body Width you can choose Body Length, Arm Length, and Inside Leg up to two sizes bigger or smaller. For example, a suit with a medium (M) Body Width can be XS, S, M, L, or XL in Body Length; XS, S, M, L, or XL in Arm Length; and XS, S, M, L, or XL in Inside Leg. If you have any questions about your size, please contact us. Body Width. Use the chart below to find your Body Width. Measure yourself without clothes, relaxed with an uninflated chest. XXXS 139 - 144cm 4'5" - 4'8"
XS 155 - 163cm 5'1" - 5'4"
S 164 - 170cm 5'5" - 5'7"
M 171 - 178cm 5'7" - 5'10"
L 179 - 186cm 5'10" - 6'1"
XL 187 - 193cm 6'2" - 6'4"
XXL 194 - 201cm 6'4" - 6'7"
XXXL 202 - 209cm 6'8" - 6'10"
Inside Arm -- can be two sizes up or down from Body Width. Inside Arm is measured from armpit to wrist-bone without clothes. When you measure your inside arm let your arm hang loosely by your side. Don't extend it horizontally. Down suits are sized to fit over thermal underwear and fleece. Shell Suits: D-type suits will fit over down clothing of the same named size: F-type suits will only fit over thermals and fleece. The arms of our suit are designed to be long enough to keep your wrists warm when your arms are extended horizontally (when using trekking poles, for example) or when you are reaching above yourself (when climbing, for example). In this respect the arm lengths of our suits differ from street/fashion jackets. "For a suit that is literally made to measure and is totally fit for purpose then look no further. You get exceptional value for money and it's more versatile than the other suits available. 9.5/10." "The Double Suit is mega. It's a really great system. I can't climb when I get hot and the Double Suit is just perfect for avoiding over-heating. I hate faff and the idea of having to unzip a traditional down suit and have it hanging around your waist is the kind of thing that makes my blood boil. I watched climbers leaving Camp 2, often in the afternoon in the heat of the Himalayan sun, on their way to Camp 3 in full down suits and it looked terrible. I wouldn't have been able to take ten steps without steaming up and going back to camp!" 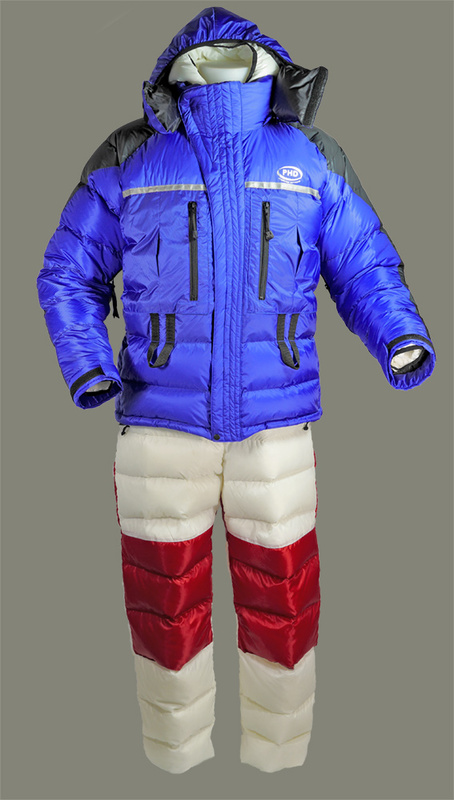 "The double suit performed extremely well again on Dhaulagiri this Autumn. When we climbed from Camp 1 (5700m) to Camp 2 (6650m), I was the only climber to be comfortable in the conditions all day. I climbed in the inner suit and base layer all day, only having to vent the pit zips from time to time. The others started in down suits and two-pieces, having to stop, remove harness and crampons etc, some climbing in down salopettes without jackets. It was another reaffirming moment that the design really does work. A faulty head torch on the summit push left me stranded without supplemental oxygen at 7600m from 2am to 5am waiting for the sun to come up. I'm not the warmest person and I managed to stay warm enough, which shows how effective the full combo suit is. Keep up the great work." "On the summit, I was ample warm with just the inner suit and came down MUCH MORE comfortable than anyone else. Overheating was a major factor for my teammates - so much so that one almost didn't get down due to a combination of fatigue and heat-exhaustion. I was chipper on the other hand. The beauty of the inner suit system was its softness and flexibility which allowed me to move a lot more freely than in a more conventional, bulkier suit." "What I find most impressive is adaptability of the system. 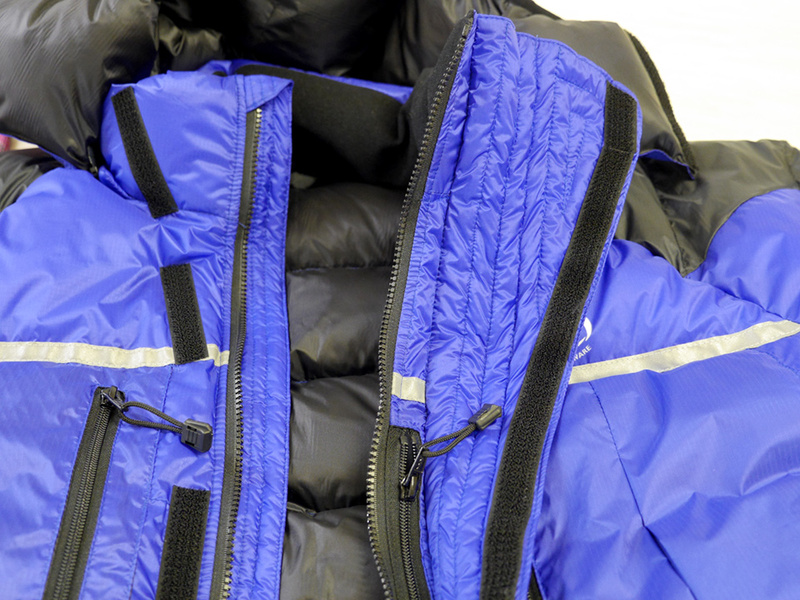 The inner suit is a 'live in' piece of gear, ideally for use above 6500m, up to over 7500m, possibly higher. Once I put it on, I didn't need to take it off until the descent to Base Camp. What I really like is this allows you to wear the suit over base and mid-layers and leave shell layers at lower camps. On average this will save around 1kg of weight. Traditional down suits have been worn only from the higher camps up to the summit. In warm conditions the climber is either uncomfortable or takes the suit off and carries it in on their back. This system allows you to utilise the insulation you are carrying lower down, climb through greater temperature ranges and generally be more comfortable and adaptable to changing weather. 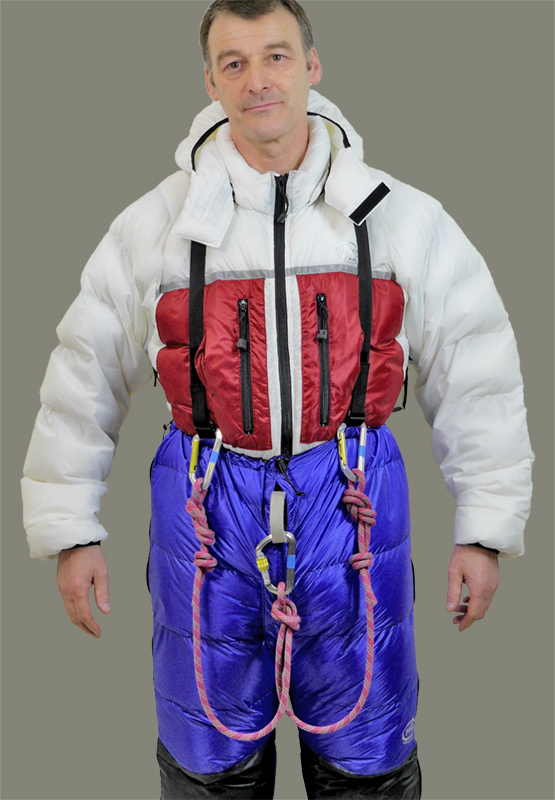 Overall, the materials used are on the cutting edge of design for high altitude gear, the build quaility is exceptional and the design concept of a double suit is functional and practical.